The recorded history of Mettler's Woods begins in 1701, when Mynheer Corneius VanLiew, a Dutchman, acquired the land. The old forest was maintained without exploitation by descendants of the original settlers, preserving a large stand of oak-hickory forest. The average age of living white oak trees in the forest is 235 years. Some trees that have died within the past two decades have been as old as 350 years. Prior to European settlement the forest was actively managed by Native Americans who routinely burned the site as a management strategy for improving productivity of the understory or driving game in the region. The occurrence of these fires is captured in the growth rings of the old trees and they have been documented to occur in 11-year intervals up to 1711. Other disturbances have included windthrow of old canopy trees by storms, and defoliation by peak gypsy moth populations. No timber has ever been cut, nor the soil turned within the forest. 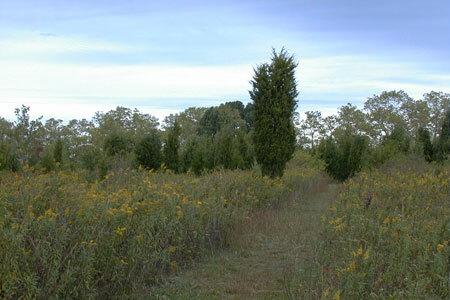 In contrast to the history of the forest, the adjacent lands were plowed or pastured for several hundred years. These fields now serve as a contrast to the old forest in scientific studies, as a buffer from damaging human encroachment into the old forest, and as a nature reserve in their own right in an increasingly urban landscape. Stark contrasts in soil erosion and structure, microclimate and plant and animal communities between the old forest and the surrounding land that has been so strongly affected by humans, is one of the important features of the HMF Center. The Hutcheson Memorial Forest Center has enjoyed the interest and active support of many people and organizations in preserving the primeval oak forest. The Citizen's Committee for the Preservation of Mettler's Woods was the first organization devoted to saving the woods when development threatened. The Committee raised funds from private donors throughout New Jersey and the U.S. The United Brotherhood of Carpenters and Joiners clenched the initial preservation effort with a donation to purchase the property in 1955. The Nature Conservancy has been a long time supporter and partner with Rutgers in the preservation of HMF. Franklin Township and the New Jersey Green Acres Program have been instrumental in recent efforts to bolster protection and buffering of the Forest. Thus, the Hutcheson Memorial Forest, named for William L. Hutcheson, a past President of the United Brotherhood of Carpenters and Joiners, is a prime example of cooperation and partnership in conservation. Since acquiring the forest in 1955, the Department of Ecology, Evolution and Natural Resources at Rutgers University has actively researched the forest and surrounding fields. With more than 60 years of data, the long-term studies of birds and of vegetation change after agricultural abandonment are some of the longest running studies of this kind, anywhere. These long-term studies are maintained today, along with dozens of other studies conducted by faculty and students from Rutgers and other institutions. In the fall of 2015, the construction of deer fence, enclosing the old growth forest was completed, in an effort to encourage the reestablishment of the historic species composition. Today, Mettler's woods and the surrounding landscape continues to advance ecological theory and regional knowledge of forest dynamics in an ever changing landscape and climate. Explore the collection of addresses and papers presented at the historic dedication of William L. Hutcheson Memorial Forest in 1955.